2006 - documentary - 60 min. In Southern Siberia, at the heart of the Altai mountains, thousands of maral deer live in gigantic protected reserves. For centuries, every spring, their velvet antlers have been cut off in a bloody ritual to provide the Koreans with a natural sought-after aphrodisiac. Throughout an entire year in Russian Altai, Red Velvet recounts the fate of the maral deer and follows the unlikely journey of their antlers to South Korea. Right in the middle of the Eurasian continent, the borders of China, Russia, Kazakhstan and Mongolia draw an X on the map. The X points at the Altai mountains, the Navel of the World. In the Russian part of Altai, for centuries, people have been making a livelihood with maral deer hunting. The Maral deer is a Siberian red deer, bigger than the American wapiti. As the population of deer depleted, in the 1840s they started farming deer in gigantic parks where the stags could feed and the females breed their babies protected from the predators. Sasha with three of his brothers and half a dozen mujiks look after 2,500 deer in Sauzar: a hundred-square-mile fenced park. There, the landscape is magnificent and the climate extravagant. The mountains look like Switzerland and the valleys like Mongolia. No matter the six-month winter where the temperature drops to –50°, the Russians spend the year on horseback. They ride through the forests to check the fences and feed the animals. They ride to herd them to other parks, to vaccinate them, to capture them and take off their horns. For, in this part of the world, the farmers don’t breed the deer for their meat but for their antlers. Deer antlers are deciduous. They fall naturally in March at the end of winter. It is the fastest growing tissue in the animal kingdom. By July, they have grown back to their full size, each year bigger. From the end of May to the beginning of July, every other day, a dozen men gallop across the park to herd the hundreds of stags towards a paddock: a highly dangerous and exhausting routine. There, Sasha examine each animal to assess the growth of its antlers. He is looking for the perfect stage when the antler, still soft and velvety, is not yet ossified. If not ripe enough, the deer are immediately set free, only to be caught again in the next round. The mature ones will be cut the day after. It is a dark wooden corridor painted in green. There is light at the end of the tunnel and the deer wants to walk out there. Doors open to let it go forward and close behind it. Just before it reaches the last door, the floor drops under its hooves and padded cushions block its sides. Men are suddenly all over it. It takes less than one minute for Sasha to saw off the pair of antlers, put on a coagulating powder and release the animal. The work is noisy, bloody and professional. There is no time to loose or the stressed animal will go into shock. A good pair of antlers sells for around $ 1,500. Steam engulfs the log cabin. The men can hardly see each other. 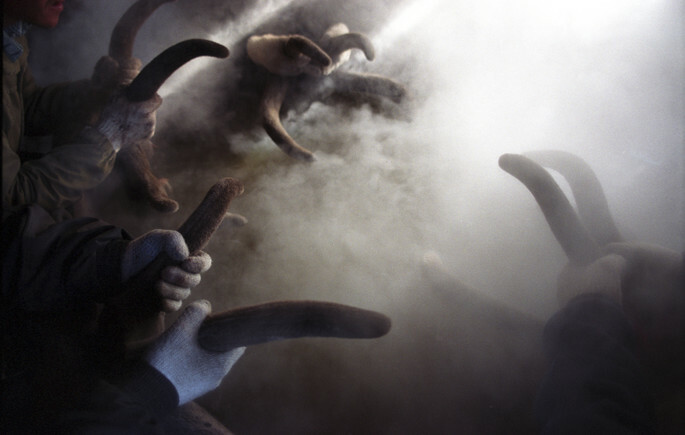 Immediately after the cutting, the mujiks assemble around a tank filled with boiling water, each one carrying a pair of horns at arm’s length. In unison they sit down and sink the antlers in the water for two or three minutes. A bit further away, smoke rises from the chimneys of four low wooden huts. Inside the temperature is set at 73°. After their bath, the antlers will be hung there to dry for four hours. The process will be repeated every other day for a month until the preservation is completed. At that time of the year, strange tourists show up in Sauzar. Wealthy Russian men in their fifties come to bathe in the brown mixture used to dip the horns. There is an obvious mental analogy between the cyclical growth and shedding of antlers and regeneration. They readily admit their belief in their aphrodisiac powers. A much older man travels every year from the northern capital to drink maral blood straight out of the cut antlers. His doctor recommended it after surgery. Sasha himself takes a glass of blood from time to time and his men sneak at night in the log cabin to enjoy a muddy bath. In Talda, the nearby village, the veterinarian has set up a small business near the bakery. Every now and then, he bleeds an animal, filters the blood, mixes it with alcohol and adds aroma. He lines up the bottles filled with the dark red sticky liquid and sticks on a tag. “Pantoguematoguen” with all the virtues of maral blood is exported to Novossibirsk and to Moscow. September brings the Korean client. Every year for the past ten years, Mr. Kim Jin Gong has been coming to Sauzar to buy 40% of the entire Siberian production. He has 20 million dollars to spend. On the other hand, Sasha’s maral farm is the biggest in Siberia. One doesn’t go without the other. With professional eyes, Mister Kim examines every single antler, checking color, smell and softness of the velvet. Here, at the “Navel of the World” two cultures are in confrontation. They forcibly get on well together and finalize the deal with a glass of vodka. Sasha can now go fishing at the mountain lake. Velvet antlers are considered the second most important ingredient in traditional medicine after ginseng. Throughout Asia, physicians have regarded it as an essential health, energy and sexual tonic for the past 2000 years. Still it is prescribed mainly to women to treat post natal and menopause disorders. 5,000 km east of the Altai mountains, in Seoul, maral antlers are cut into paper thin slices and sold at 400% profit by doctors and hospitals specialized in herbal medicine. Researchers at Seoul Kyung Hee University Hospital study the effect of antlers extract on the brain cells of rats to treat Alzheimer and paralysis. The nightmare of the cutting has been long forgotten and the herd of bald deer graze peacefully in the meadows. The birches and larches already turn yellow and the temperature drops at night below zero. Once more the mujiks ride through the mountains to open all the gates between the parks. Females, stags and young are at last united. The 15th of September marks precisely the beginning of the mating season. The valley echoes with spine tingling wailing: the loudest bugling of the maral deer. Not the least affected by their missing antlers, the stags parade, fight for their harems and mate as they would in the wild. Every year, a couple of lucky males escape Sasha’s saw but they don’t seem to enjoy more popularity with the females. These are people and animals made for the cold. They liven up at minus forty. Stronger and bigger, livelier. By November winter has already fully settled in. Bright sunshine followed fog and snow followed hail. Predators roam outside the parks and the fences have to be checked daily. It is time to separate the deer again. Like Russian bears on horseback the mujiks ride in silence through the snow for the last and most beautiful drive of the year. Although gigantic, the parks are not big enough to allow all the animals to feed by themselves in winter. Every single day from November to March, the men bring them tons of hay, grain and fodder. The deer line up along the troughs like cattle. The deer grow back their antlers in March and with spring comes back their wildness. Only mountain grass can be as green as this. Sasha and Vladimir ride to check on the females. Shadows behind fir trees, they flee. The one who does not, has hidden her baby somewhere nearby. Flat and brownish like a anthill, it lies down motionless. Vladimir bends down to fondle the unbearably cute fawn. Like a Walt Disney drawing, the lashes underline the wide hazelnut eyes and the shiny wet nose trembles imperceptibly. Vladimir’s hand strokes the forehead, notices two bumps under the fur.